Whether it is freezing cold or blistering hot outside, we have you covered. 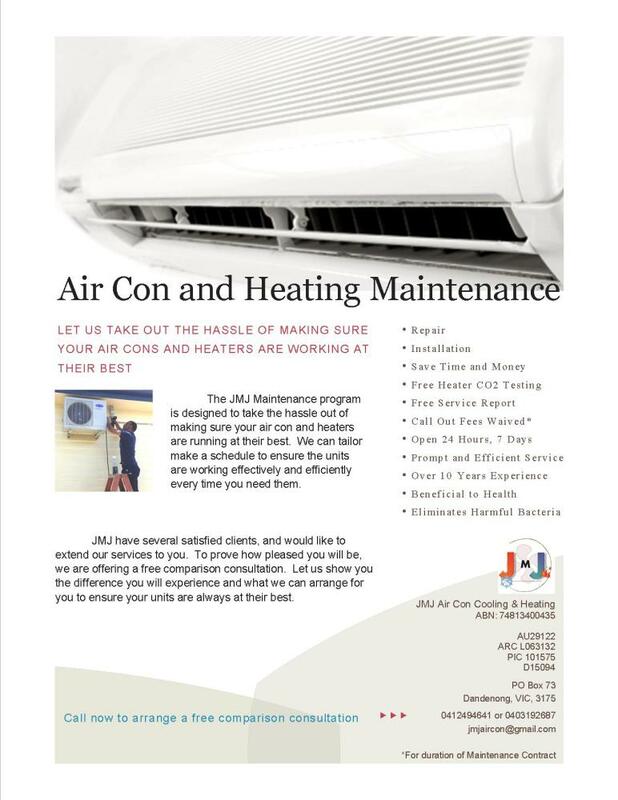 JMJ have years of experience in installing, repairing and servicing, heating and cooling appliances. We can give you the best advice at competitive prices. Make sure you get it right the first time, everytime. We can come to your property, speak to you over the phone or reply to an email with a free no obligation quote. You can even send through floor plans and we can easily work from that. We accept EFTPOS, Credit Card, Mastercard, Visa, cheque, cash and direct debit. We also install add ons to both heating and cooling. In accordance with plumbing regulations, we will provide a certificate of compliance for all air conditioning installations. All units come with warranty, which is easily maintained by filling in the warranty form and having a service visit from JMJ every 1 - 2 years. Call us day or night, any day of the week, and even on public holidays, and we will do our best to attend to repairs, maintenance and emergencys. JMJ technicians can handle any problem solving needs, big or small. Giving you the best advice from sound knowledge and more than 10 years experience in the industry. Service and maintenance of all appliances is extremely important to keep the units working at their very best and for warranty purposes. Even more importantly, it is beneficial to the health of family, friends and colleagues by eliminating harmful bacteria. For heaters, it is imperative to have regular servicing, as they are known to sometimes omit carbon monoxide. This gas is very dangerous and has been label as a 'Silent Killer' as you can not smell it or see it. That is why we provide free carbon monoxide testing with every heater service. So please do not delay. Our most common call we get for air conditioners, is to top up refrigerant which is something we can do very easily. We also offer maintenance contracts, which helps to keep appliances performing at its optimal best. Just let us take care of it all for you. Contact us today and we can tailor a package suitable to you, which will include call out fees being waived for the duration of the contract. Below is our maintenance flyer. We have many satisfied customers from residential, commercial and industrial properties. We even work closely with several real estate agents, schools and other businesses. Our office is located in Lynbrook and we are happy to work Melbourne wide. Whatever your needs, we are sure to accomodate.